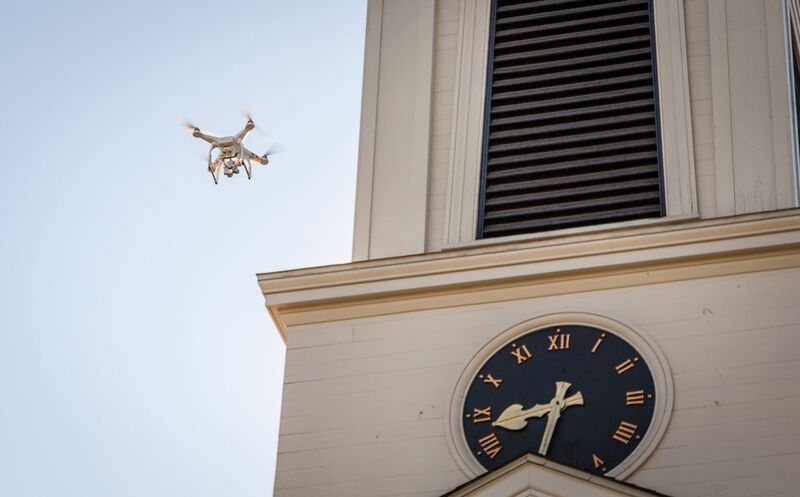 Museum staff use a drone to understand conservation issues on a 19th- century tower clock. Back in February, volunteer Jim Anderson was interviewed for an article about the work he and another volunteer, Bill Michael, were doing on the Museum’s 1857 tower clock located in the Greenmanville Church. You can see that article here. In it, Jim talks of the challenges the two men faced in repairing the mechanism that runs the four separate clock faces, one for each face of the tower. While Jim and Bill have worked wonders with the clock, they still face a few challenges to keep the clock running regularly. One issue that raises its ugly head on occasion is the fact that the clock stops before the regular rewinding because of a problem with hands on one of the faces binding. Because the problem seems to be on the exterior of the building, and the building is quite high, the two decided to contact our Film and Video crew to help troubleshoot the matter. That’s right, film and video. 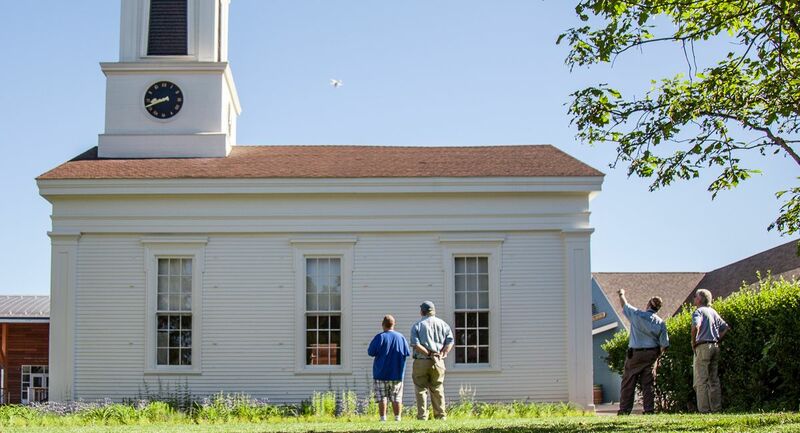 You see, Dan Harvison and Brandon Morgan, the creative team that shoots and produces much of the Museum’s programs, have been trained in operating a drone for their work. In order to get some good shots of the clock hands to see how they are attached on the outside of the building, Dan was asked to pilot the mosquito-sounding drone close enough to the tower to try and get appropriately detailed images to analyze the problem. Once the issues are identified, someone will still need to get in a lift and take their tools up to do the job, but our hope is that we will only need to employ the bucket lift once, rather than twice. See some images of the shooting below. Dan Harvison operates the drone under the watchful eyes of Anderson, Michael and O’Pecko. The drone moves in for a close-up of the east clock face.